Already own a home in the Sunset Shores subdivision? Thinking of selling? Click here and read about current search trends & our web network. Sunset Shores is located on Bon Secour Bay in Foley, AL. 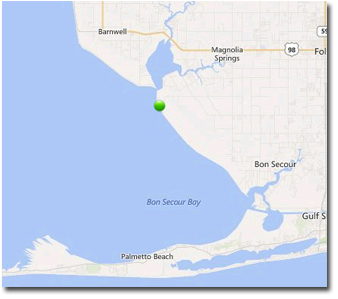 The Bon Secour Bay opens in to Mobile Bay and the tip of Fort Morgan to the West is the entrance to the Gulf of Mexico. As you can see from the map left, it's a straight shot to the gulf and only takes about a half an hour to forty five minutes to reach the gulf. Sunset Shores is also a quick trip to Mobile, AL which offers the closest regional airport and not much farther from Pensacola, FL which also has a regional airport. Sunset Shores is in a rural section of Foley and is off-the-beaten-path, so-to-speak, but quickly turns in the the city of Foley with a wide variety of things to do and only 30 minutes, or less, from the beautiful beaches of the Alabama / Florida Gulf Coast. Please let us know if you would like further info on Sunset Shores or any other homes or real estate in the Foley area or would like to schedule a private viewing by emailing info@condoinvestment.com or by calling 251-Area-Pro (251-273-2776) for immediate assistance. The community of Sunset Shores is roughly 30 minutes to Alabama's powder-white beaches using either the Foley Beach Express or Highway 59. We provide in-depth information such as detailed descriptions and amenity lists for all Orange Beach condos and Gulf Shores condos for sale. Search for gulf coast real estate using our interactive maps, predefined searches, or input your own criteria on our Create a Search page. Find condos walking distance to popular attractions like The Hangout in Gulf Shores, Gulf Place, Flora-Bama, and Gulf State Park. Browse Perdido Key, FL condos for sale, a small beach community a few miles to the east of Orange Beach. We provide custom searches for condominiums that offer boating facilities and popular onsite amenities like heated indoor pools, hot tubs, and lazy rivers. Our network has recently expanded to the Emerald Coast and features real estate listings and information for Pensacola, Fort Walton, Destin, and Panama City Beach. Condos along the Gulf Coast are some of the best investment opportunities for producing extra income. We help potential investors by sharing annual rental revenue information for each condominium in the area.